High-heat friction causes wear and tear on firearms. All moving parts need to be properly lubricated to operate smoothly. When moisture is exposed to metal surfaces, rust will form. Corrosion eventually ruins the look of a firearm and can halt its ability to function. Our full line of gun lubricants and protectants effectively reduce wear and tear caused by friction and provide a barrier of protection against moisture, debris and corrosion. Synthetic gun oil formula prevents rust and gives superior lubrication for all moving metal parts, even in extremely cold climates. Odorless formula emits no telltale odors. This product will not gum up. This superior lubricant is polarized to bond naturally with metal to form a lasting protection against corrosion. Special rust-protecting additives increase lubricity and rust prevention. This product will not gum up to -40ï¿½F and it performs effectively in a full range of temperatures. 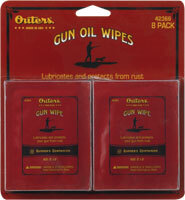 These oversized, 6-inch by 8-inch, wipes are imbedded with Gun Oil to provide quick and easy application. This product will not gum up and it performs effectively in a full range of temperatures. Convenient wipes are available in individual packets or a handy pop-up dispenser. This heavy bodied grease type lubricant is perfect for choke tube threads and moving parts such as hinge pins on break open shotguns. It is also effective for providing rust and corrosion protection during periods of prolonged storage. This 3-way gun treatment is a high performance product that features a specialized 3-in-1 formula cleans metal surfaces, provides increased lubricity and adds a film of rust and corrosion protection. This handy 100% Canton flannel cloth is perfect for cleaning, lubricating and protecting a variety of gun finishes. It won't scratch gun finishes and is impregnated with our Tri-CareTM combination of cleaner, lubricant and rust preventative. This large, 11-inch by 13-inch, cloth provides a convenient, quick, one step wipe down to neutralize scent and protect exterior of firearm against moisture, debris and rust. Cloth is impregnated with an odor neutralizer and a special silicone ingredient.